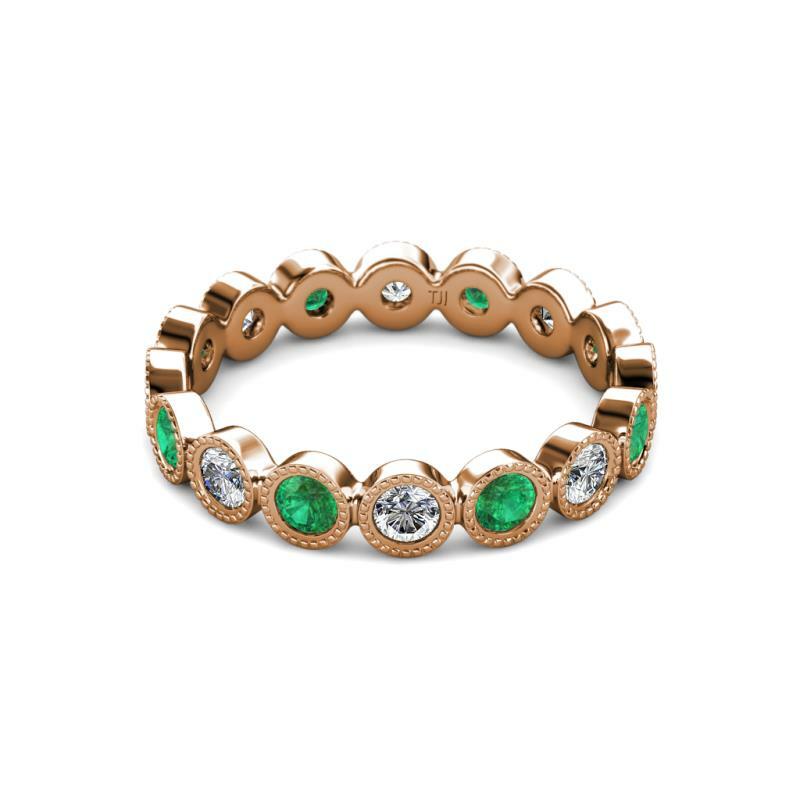 3.00 mm Emerald and Diamond Eternity Band This Elegant Eternity band 1.11 Carat tw-1.28 Carat tw encircles the finger with Series of Diamond and Emerald in Milgrain-Texture with Bezel Setting which symbolizes the Eternal Circle of Love and cherishes its Shimmery Look. *As per ring size the stone and carat total weight changes. 5 stars, based on 4 reviews Condition: $1791 New In stock! Order now! Order in 1:26 hrs to get it by 3rd May 2019 with Overnight Delivery Learn More. Normal processing time for this item is 4 to 5 business days before it ships and it will ship via your chosen ship method after the processing time is complete. 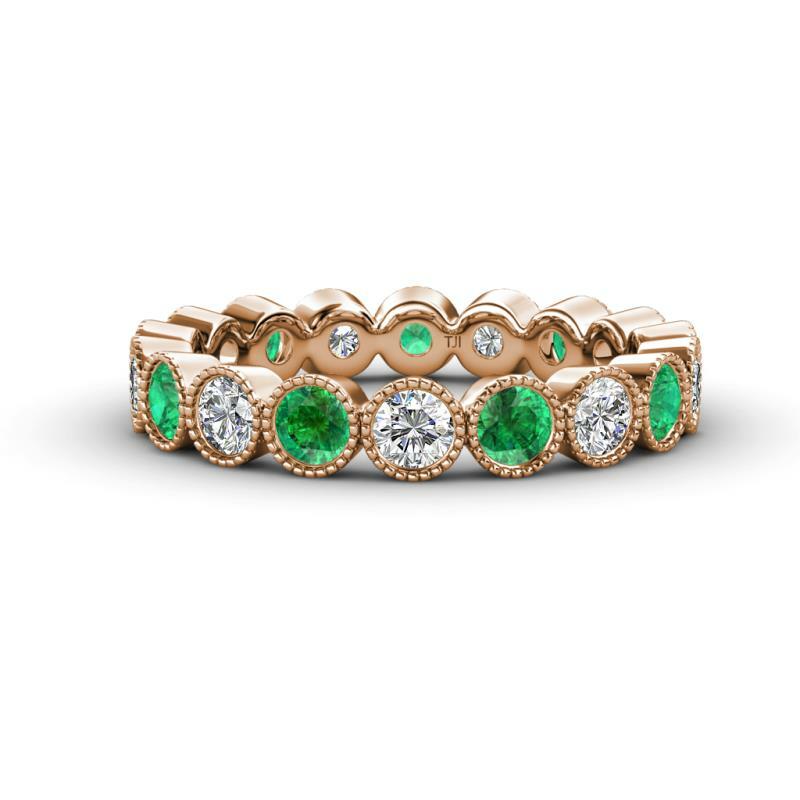 This Elegant Eternity band 1.11 Carat tw-1.28 Carat tw encircles the finger with Series of Diamond and Emerald in Milgrain-Texture with Bezel Setting which symbolizes the Eternal Circle of Love and cherishes its Shimmery Look. *As per ring size the stone and carat total weight changes. 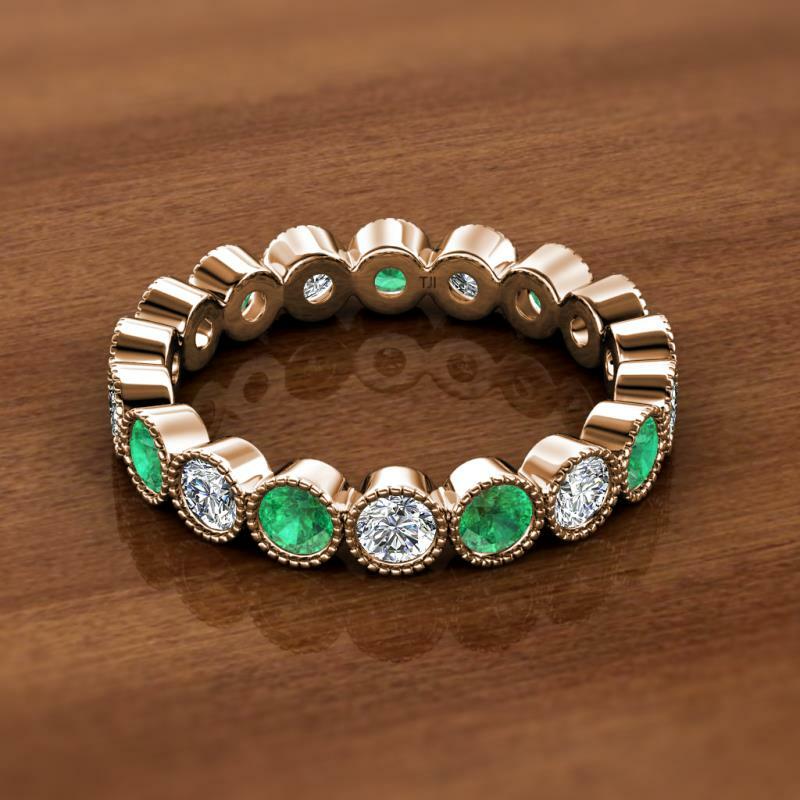 Emerald and Diamond are set using Bezel Setting. My ring is beautiful! I am so pleased with the quality and craftsmanship. The ring is prettier than I expected, I am so very pleased. I am extremely happy with my new stackable band!!! It was a bit scary buying a ring online but Vijay made it so easy. I was even sent a sample ring and ring sizers to be sure that it fit just right. I can absolutely vouch for the service and quality. I keep staring at my hand with the new band on it and I smile from ear to ear! Amazing customer service and stunning ring! Amazing experience shopping online with Trijewels. Love my ring! Received a personal phone call to confirm size before they make it. So impressed with the craftsmanship and the owner Vijay is a pleasure to deal with. Will definitely shop again with them. Thank you Trijewels team! I could not be happier with this ring! 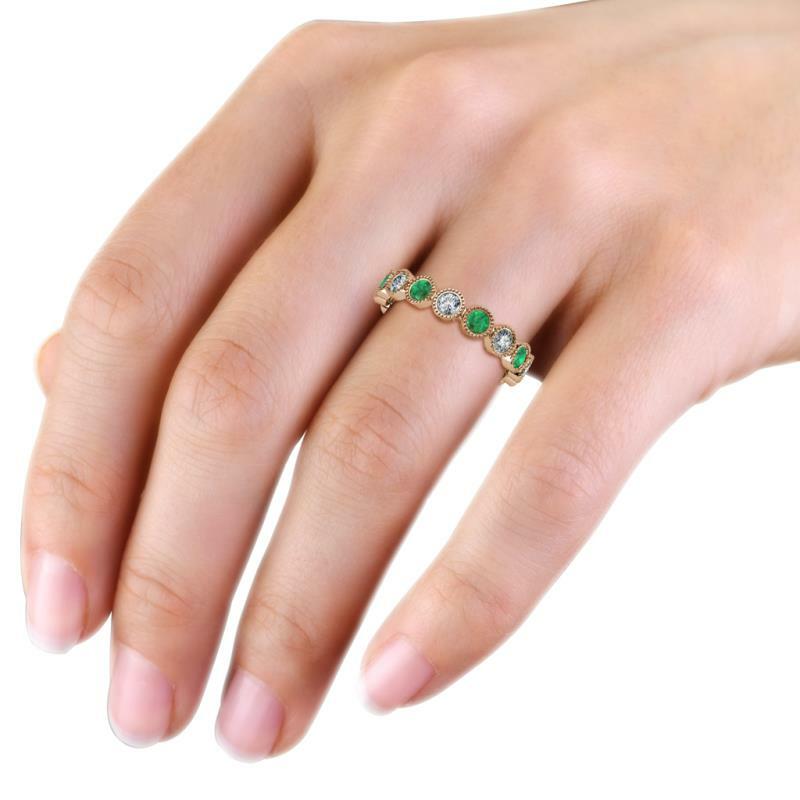 After finding this ring pinned on Pinterest and having our jeweler in Houston tell us he did not want to make it for us (after having made my engagement, wedding, and eternity band with my daughter's birthstone because "emeralds were too hard to work with"), I contacted Trijewels directly, but was hesitant to buy good jewelry over the internet. I could not have been happier with the service either. I got a phone call the same day and was sent samples in the mail to try on to make sure this style and size would match my other rings. The millgrain setting is gorgeous and looks identical to my much more expensive, custom made rings. I am also a half size, and he worked with me on that too. Do not hesitate to buy from here! Vijay and team were a tremendous help with designing a birthday gift for my wife. The communication and end product were perfect. Thank you all, my wife loves the finished product. I would highly recommend Vijay and team! The ring was exactly as described and was of high quality and craftsmanship. I bought this ring as a surprise gift for my wife and it is absolutely beautiful! My wife loves the ring and wears it every day! 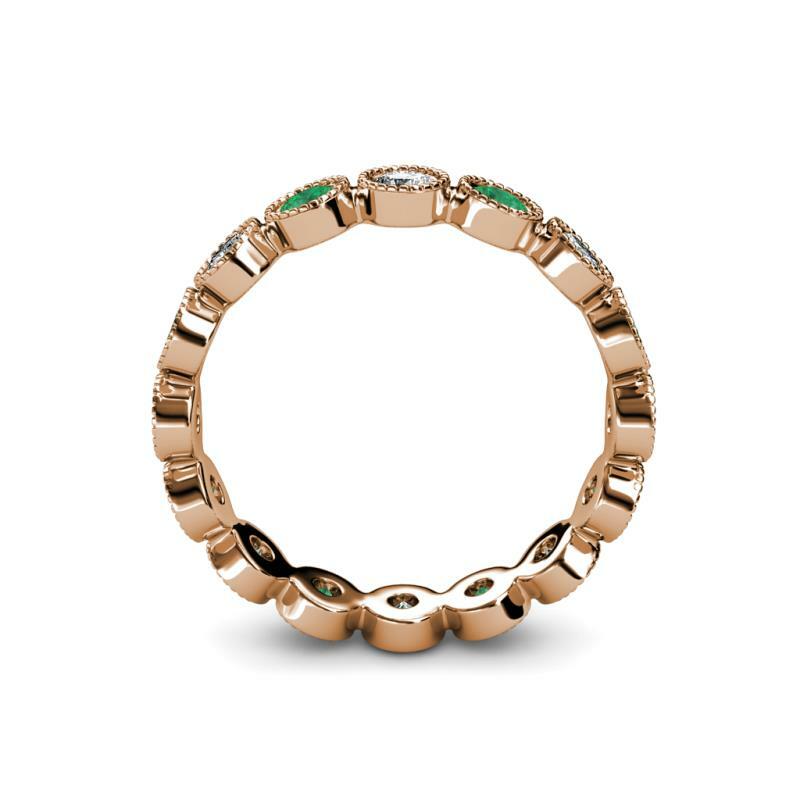 Truly stunning and looks like a designer ring! Customer service was also tremendous, as I ordered the wrong size originally but Trijewels worked with me in order to arrange for a replacement with the correct size. Highly recommend both the ring and purchasing from Trijewels for their commitment to the customer! Amazing experience! Vijay was simply wonderful. He was so accommodating with my indecisiveness and made the experience so much better. He was able to make me a beautiful single prong eternity wedding band to go specifically with my engagement ring. He was able to tweak the ring in ways that would fit with my engagement ring perfectly. The process was so quick too!!! And Vijay was very quick to answer any emails or text messages (even when he was on holidays). I cannot wait to start ordering more products from him. He's truly a gifted jeweler!!! !